No matter what their reasons or how they approach the question, agnostics and atheists are fundamentally different, but also non-exclusive. Many people who adopt the label of agnostic simultaneously reject the label of atheist, even if it technically applies to them. 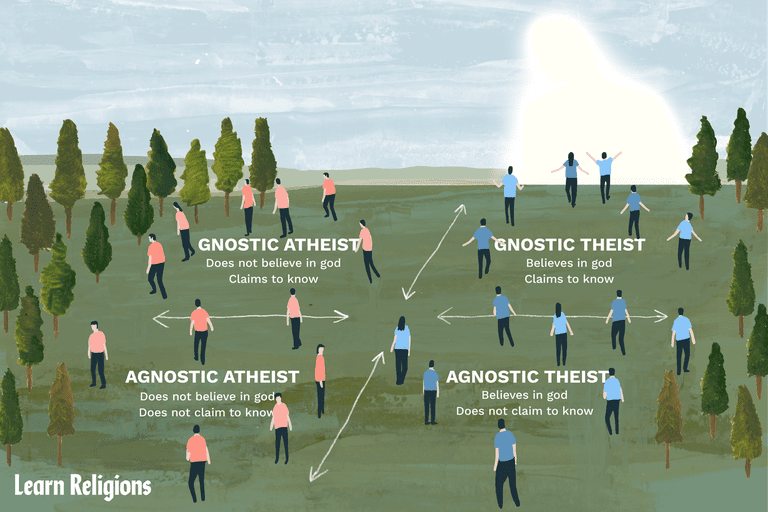 In addition, there's a common misconception that agnosticism is somehow a more “reasonable” position while atheism is more “dogmatic,” ultimately indistinguishable from theism except in the details. This is not a valid argument because it misrepresents or misunderstands everything involved: atheism, theism, agnosticism, and even the nature of belief itself. Let's explore the differences between being an atheist and an agnostic and clear the air of any preconceptions or misinterpretations. An atheist is anyone who doesn't believe in any gods. This is a very simple concept, but it's also widely misunderstood. For that reason, there are a variety of ways to state it. Atheism is the lack of belief in gods; the absence of belief in gods; disbelief in gods; or not believing in gods. The most precise definition may be that an atheist is anyone who does not affirm the proposition "at least one god exists." This is not a proposition made by atheists. Being an atheist requires nothing active or even conscious on the part of the atheist. All that is required is not "affirming" a proposition made by others. An agnostic is anyone who doesn't claim to know whether any gods exist or not. This is also an uncomplicated idea, but it may be as misunderstood as atheism. One major problem is that atheism and agnosticism both deal with questions regarding the existence of gods. Whereas atheism involves what a person does or does not believe, agnosticism involves what a person does or does not know. Belief and knowledge are related but nevertheless separate issues. There's a simple test to tell if one is an agnostic or not. Do you know for sure if any gods exist? If so, then you're not an agnostic, but a theist. Do you know for sure that gods do not or even cannot exist? If so, then you're not an agnostic, but an atheist. Everyone who cannot answer "yes" to one of those questions is a person who may or may not believe in one or more gods. However, since they don't also claim to know for sure, they are agnostic. The only question then is whether they are an agnostic theist or an agnostic atheist. An agnostic atheist doesn't believe in any gods while an agnostic theist believes in the existence of at least one god. However, both do not make the claim to have the knowledge to back up this belief. Fundamentally, there is still some question and that is why they're agnostic. This seems contradictory and difficult, but it's actually quite easy and logical. Whether one believes or not, they can also be comfortable in not claiming to know for sure that it's either true or false. It occurs in many different topics as well because belief is not the same as direct knowledge. Once it is understood that atheism is merely the absence of belief in any gods, it becomes clear that agnosticism is not, as many assume, a “third way” between atheism and theism. The presence of a belief in a god and the absence of a belief in a god does not exhaust all of the possibilities. Agnosticism is not about belief in god but about knowledge. It was originally coined to describe the position of a person who could not claim to know for sure if any gods exist or not. It was not meant to describe someone who somehow found an alternative between the presence and absence of some particular belief. Yet, many people have the mistaken impression that agnosticism and atheism are mutually exclusive. But why? There's nothing about "I don't know" which logically excludes "I believe." On the contrary, not only are knowledge and belief compatible, but they frequently appear together because not knowing is frequently a reason for not believing. It's often a very good idea to not accept that some proposition is true unless you have enough evidence that would qualify it as knowledge. Being a juror in a murder trial is a good parallel to this contradiction. By now, the difference between being an atheist and an agnostic should be pretty clear and easy to remember. Atheism is about belief or, specifically, what you don't believe. Agnosticism is about knowledge or, specifically, about what you don't know. An atheist doesn't believe in any gods. An agnostic doesn't know if any gods exist or not. These can be the exact same person, but need not be. In the end, the fact of the matter is that a person is not faced with the necessity of only being either an atheist or an agnostic. Not only can a person be both, but it is, in fact, common for people to be both agnostics and atheists or agnostics and theists. An agnostic atheist won’t claim to know for sure that nothing warranting the label “god” exists or that such cannot exist. And yet, they also don’t actively believe that such an entity does indeed exist.